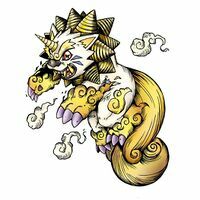 A Digimon which has the appearance of the legendary holy beast, the "Siisaa". It has the power to sweep away calamity, and exhibits tremendous power toward evildoers. It is an ally to those that are kind-hearted, and will try to protect its Tamer from every calamity, even if it has to sacrifice its own body. Contrary to its heroic appearance, it usually basks leisurely in the sunlight, due to its docile personality. However, the sunlight is an important factor for Siesamon, because it charges its life energy. 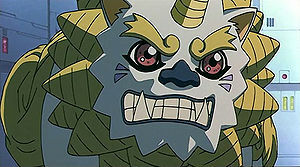 Its Signature Move "Sekkantou" temporarily prevents the intrusion of evil Viruses, as a kind of Firewall. Its Special Move is firing countless holy arrows of sunlight (Tiida Ija). 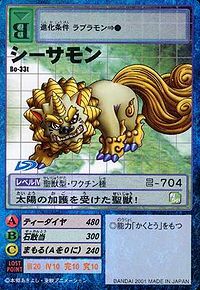 | The Shīsā (シーサー) is a lion-dog said to protect the islands of Okinawa. The beast is represented throughout Okinawa and Japan by auspicious statues. Seasar is a corruption of "Shīsā." Tiida Ija  Sun's Courage ティーダ・イヤ N/A Fires countless holy arrows of sunlight. 石敢当 N/A Temporarily prevents the intrusion of evil Viruses, as a kind of Firewall. Siesamon is the partner of Uehara Minami and the reincarnation of her pet dog, Mei. He Realized from the laptop her V-Pet was kept in to fight off the digimon sent to capture her. He secretly contains the powerful Vaccine Program developed by her father to destroy all of the other V-Pets in case they ran wild. 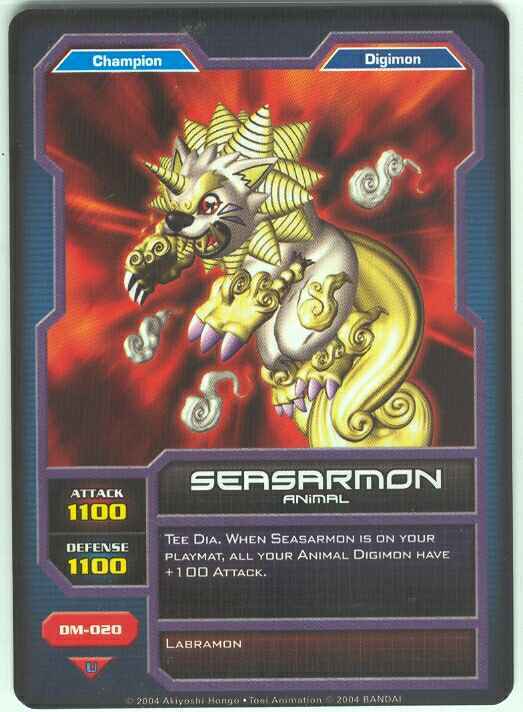 Siesamon can be evolved from Ganimon. 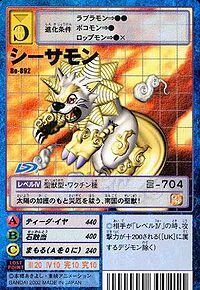 Can be evolved from Bakumon. 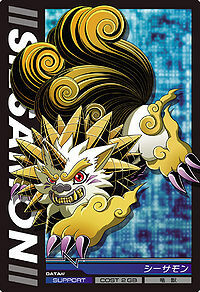 Siesamon is available as a Digimon Medal. 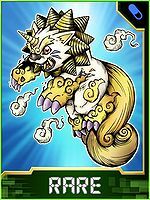 Can be evolved from Patamon, Terriermon or Impmon. 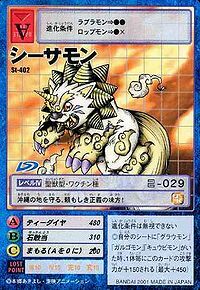 Can be evolved to Holy Angemon, Neo Devimon, Bastemon or Lady Devimon. This reliable ally of justice protects the grounds of Okinawa! Receiving the sun's protection, this northern holy beast gets rid of disasters! A holy beast that has received the sun's divine protection! 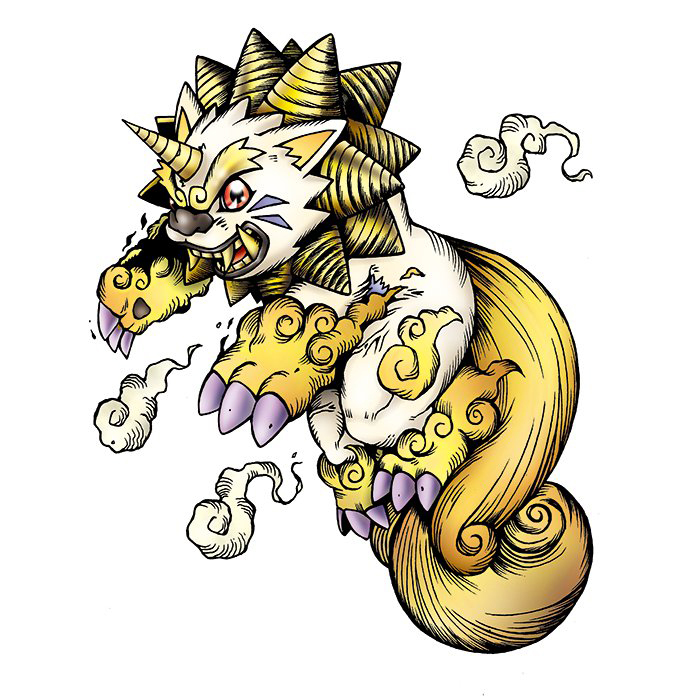 A Digimon which took the form of the Shisa, an Okinawan holy beast. 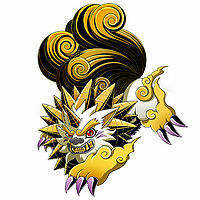 Possessing the sun's energy, it protects its Tamer from any sort of disaster, and exhibits great power when facing evil. This page was last modified on 18 October 2018, at 13:40.